Bucilla Embroidery Kits are designed to have everything you need to complete the embroidery project all in one kit. 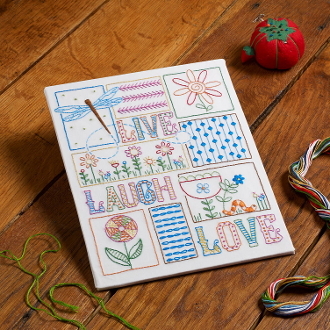 Stamped Live, Love, Laugh - Design has flowers, a dragonfly, inchworm, patterns, and the words Live, Laugh, and Love. Kit includes: stamped 50/50 poly/cotton broadcloth, cotton embroidery floss, needle, and instructions. Hoop not included. Finished size is about 8" x 10".